"Discover the lives of outstanding people from designers and artists to scientists and writers. With stylish and quirky illustrations and extra facts at the back, this empowering series celebrates the important life stories of wonderful women of the world. All of them went on to achieve incredible things, yet each of them began life as a little child with a big dream. These books make the lives of these role models accessible for children, providing a powerful message to inspire the next generation of outstanding people who will change the world!" My youngest daughter loves learning about historical events and people. She has become my little history buff. So, when I heard about the "Little People, Big Dreams" series from Quarto Knows, I couldn't wait to get my hands on a couple of their new releases to share with her. Right now she is all about women in history, and learning about their great achievements, and how many came from nothing or struggled early in life, but persevered to see their dreams come true. Thanks to the kind folks at Quarto Knows, they sent along their Anne Frank and Mother Theresa books for us to review. I wish you could have seen my daughter's face when I handed her the books. She loves these two, and can talk your ear off about them, and what she knows. Anne Frank is a personal favorite of hers, and she hopes one day to visit the Anne Frank museum to see the secret annex for herself. These two books are great in introducing children to these outstanding people in history, including all about their lives, facts and even photos. I like how the books are written like a story in the beginning, full page illustrations and text at the bottom, to keep kids engaged, as read through the pages. Unlike other biographies or books about famous people, these books are written with kids in mind, so it is written to introduce them to these people, and get them excited about learning more about them when they are done. Both of my girls really enjoyed these two books, and love sharing all about Anne Frank and Mother Teresa. They both want me to pick up more books in this series so that they can learn about other influential women in history. I love seeing them get excited about learning about these women, and it is reminder to them that they can dream big and can achieve great things, too. This is such a wonderful series, and one I will be buying more so that we can start our own "Little People, Big Dreams" collection, to enjoy for years to come. 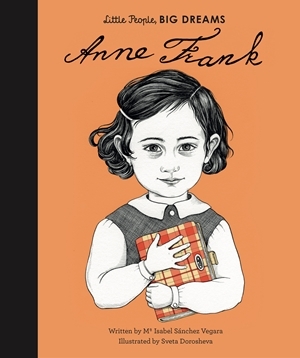 "New in the critically acclaimed Little People, BIG DREAMS series, discover the life of Anne Frank, the writer whose diary captured the hearts of the public. Anne Frank was born in Germany to a loving family. But when World War II broke out, Anne and her family had to hide in a secret annex in Amsterdam. Here, Anne wrote her famous diary, describing her belief in people's goodness and her hopes for peace. After the war, her diary captured the hearts of the public and she became one of the most important diarists of the 20th century. This moving book features stylish and quirky illustrations and extra facts at the back, including a biographical timeline with historical photos and a detailed profile of Anne's life." 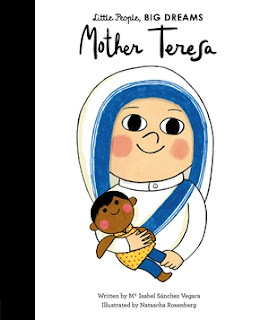 "New in the critically acclaimed Little People, BIG DREAMS series, discover the incredible life of Mother Teresa, along with her message of love and charity. Agnes (later to become Mother Teresa) was born in Skopje, Macedonia. From an early age, she knew she wanted to dedicate herself to religion. She was fascinated by stories of missionaries helping people and wanted to do the same. She spent the rest of her life caring for the sick and poor around the world and is now remembered as Saint Teresa of Calcutta. This moving book features stylish and quirky illustrations and extra facts at the back, including a biographical timeline with historical photos and a detailed profile of Mother Teresa's amazing life." 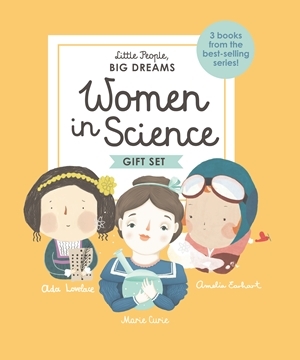 With the holidays fast approaching, why not consider picking a few books from the best-selling "Little People, Big Dreams" series, or one of their new gift sets which includes three books in one. While toys are nice, wouldn't it be better to share these wonderful books with young children and show them that they can dream big and with hard work and perseverance, they can be whatever they put their mind to, and achieve great things, like the people covered in this series. I know for my girls, that they would love reading these books and learning more about women in history who had achievements in science and art. "This empowering series offers inspiring messages to children of all ages, in a range of formats. The board books are told in simple sentences, perfect for reading aloud to babies and toddlers. The hardback versions present expanded stories for beginning readers. Boxed gift sets allow you to collect a selection of the books by theme. Paper dolls, learning cards, matching games and other fun learning tools provide even more ways to make the lives of these role models accessible to children. Inspire the next generation of outstanding people who will change the world with Little People, BIG DREAMS!" 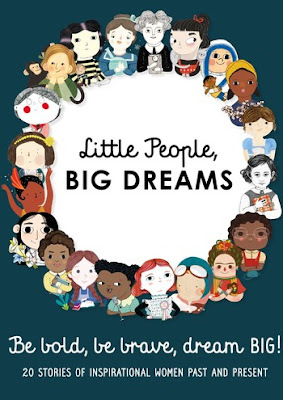 To learn more about this series, and to order books for your children, head on over to https://www.quartoknows.com/campaigns/Little-People-Big-Dreams/ today.